Snap your fingers to this rockin' Michael Jackson tribute for percussion ensemble from Alfred’s Pop Percussion Ensemble Series. 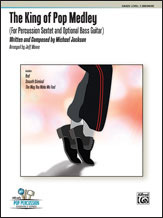 Featuring the hit songs Bad, Smooth Criminal, and The Way You Make Me Feel, this arrangement can be used for a six-part percussion ensemble, with optional bass guitar for extra support. Includes parts for Orchestra Bells, Xylophone, Marimbas 1 and 2, Vibraphone, Bass Guitar, and Drumset.